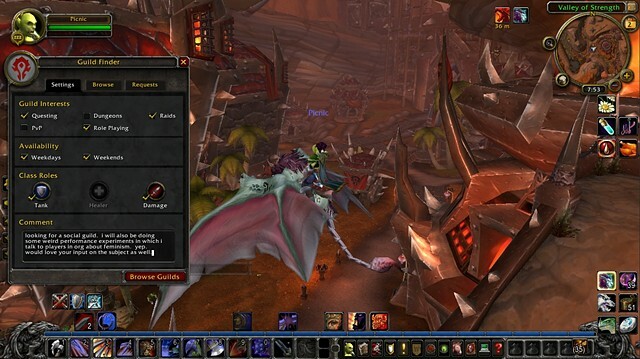 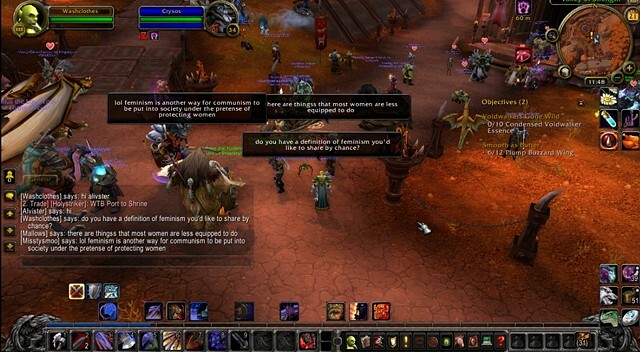 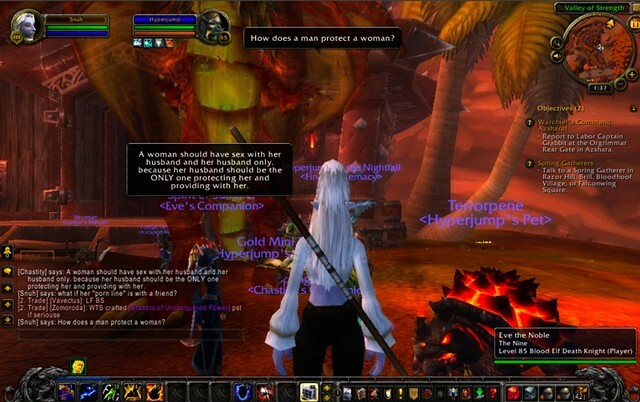 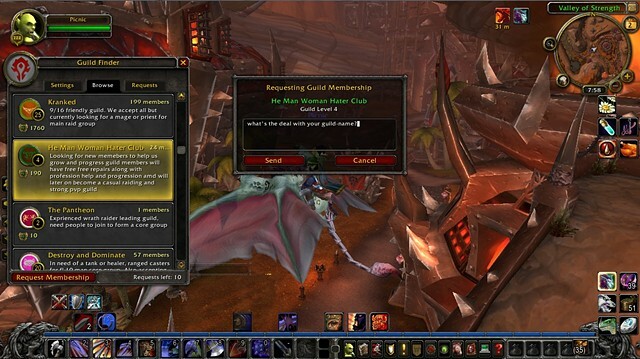 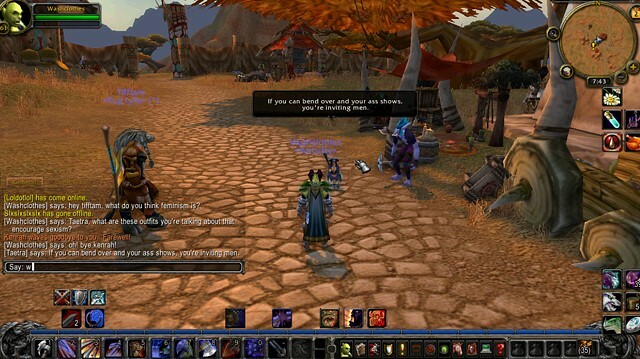 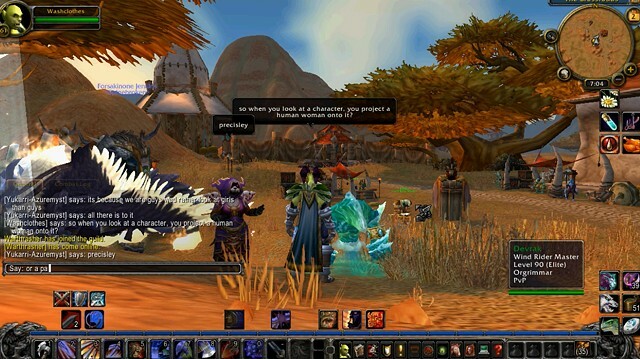 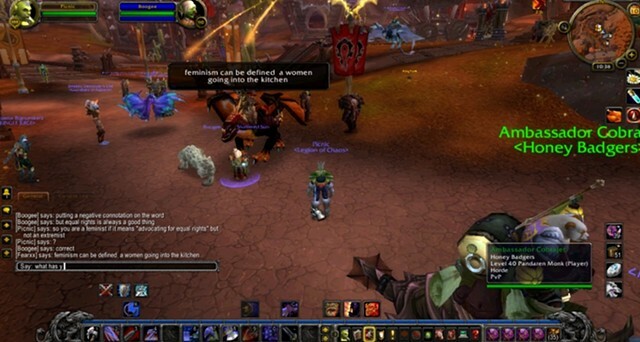 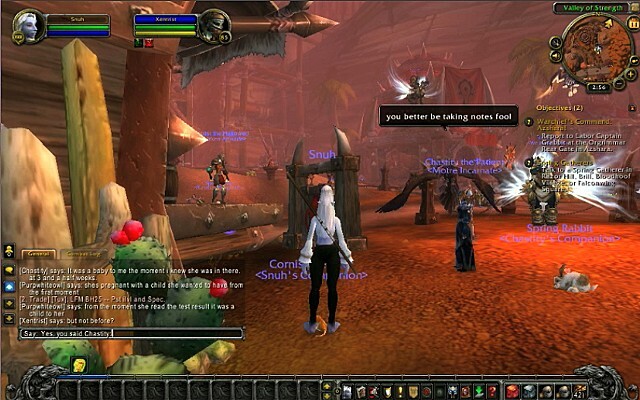 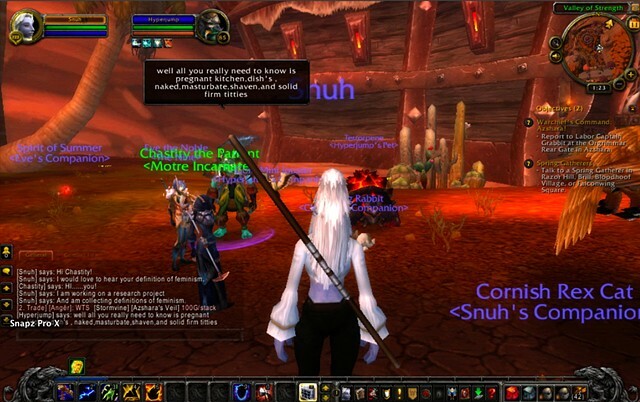 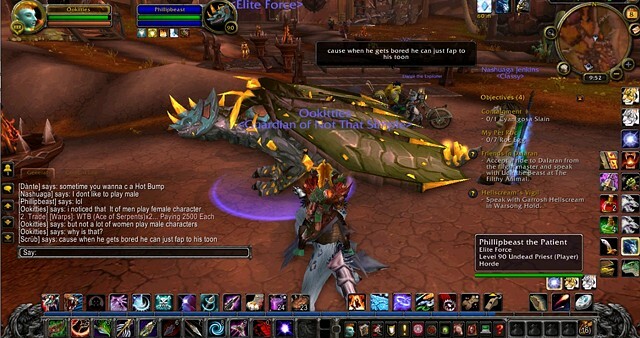 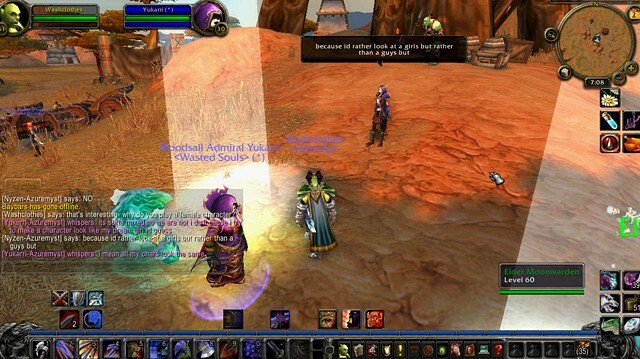 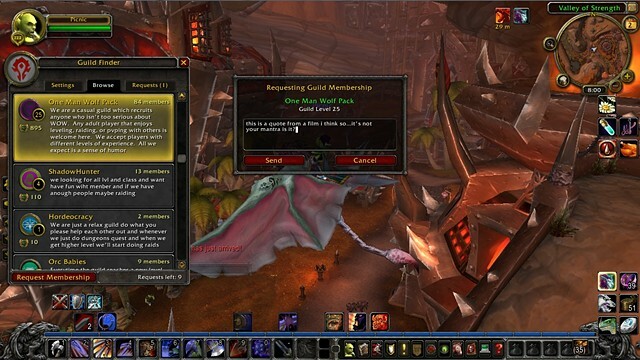 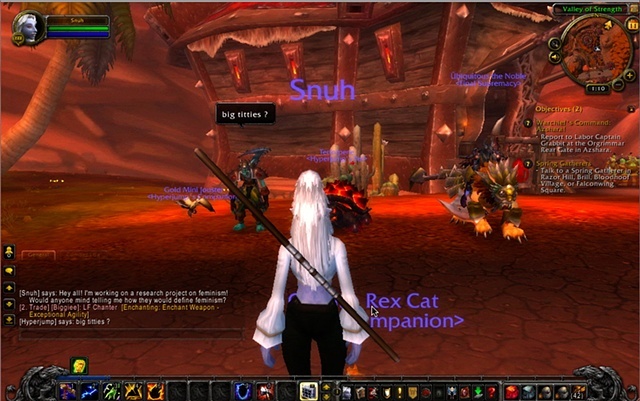 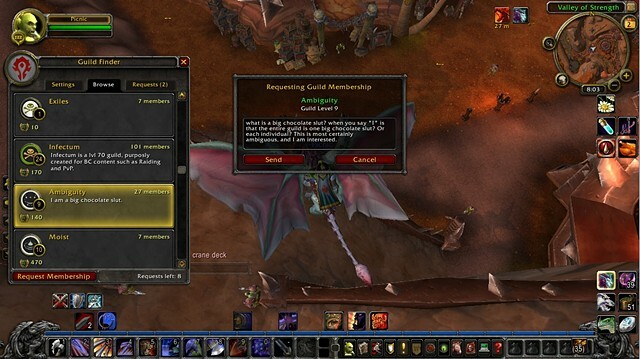 I am interested in the unusual political space that evolves within World of Warcraft. 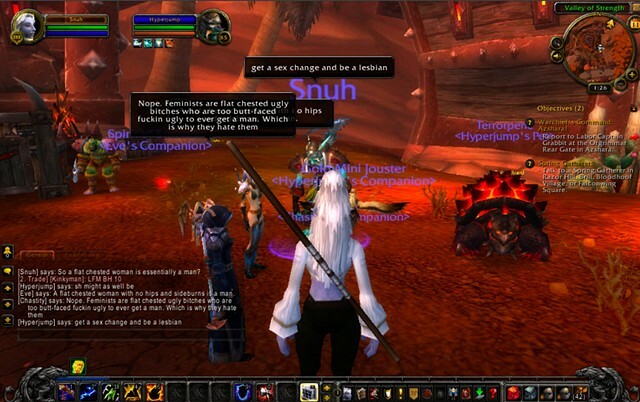 It takes quite a lot of effort to ever break into the social aspects of the game. 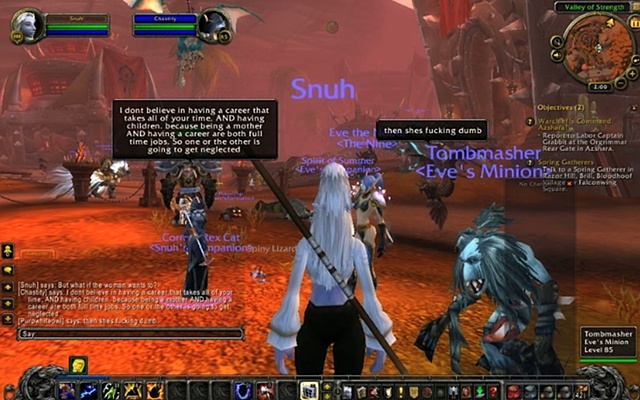 One has to make a fairly serious commitment to the game (undergoing lengthy tutorials, innumerable quests, training professions, learning their characters’ skills, equipping the character so it can survive in inevitable combat) to ever make it to the point where they are in a guild and regularly communicating with large groups of people. 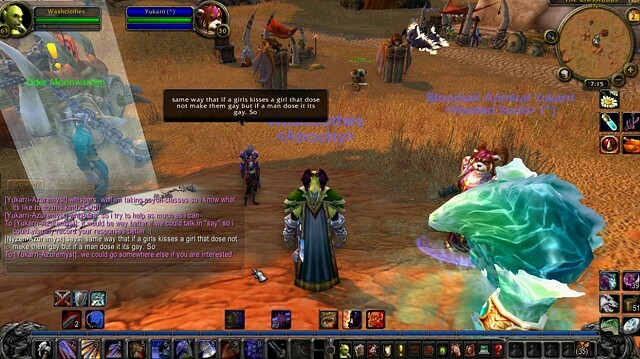 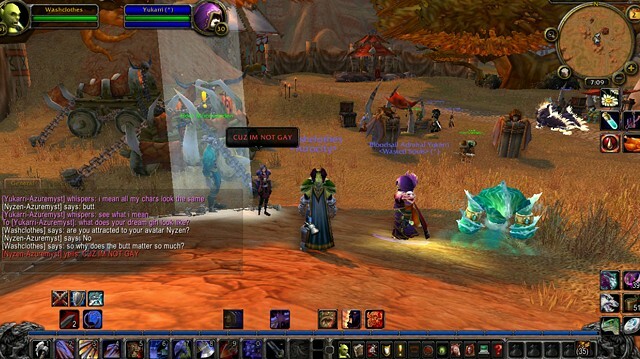 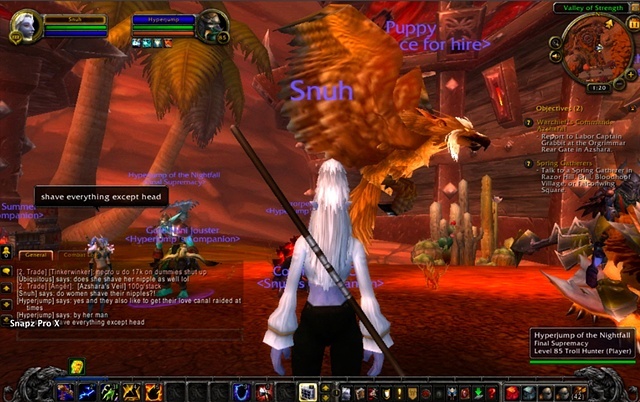 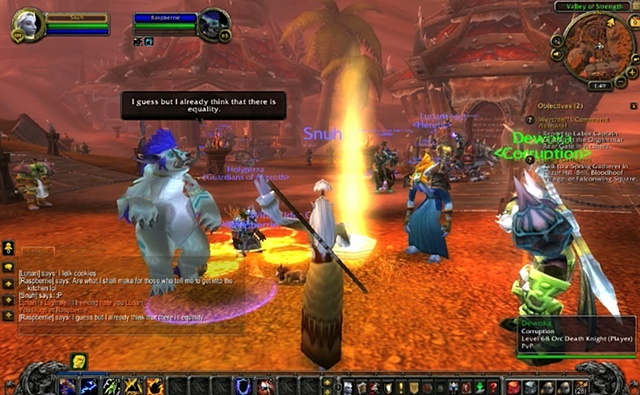 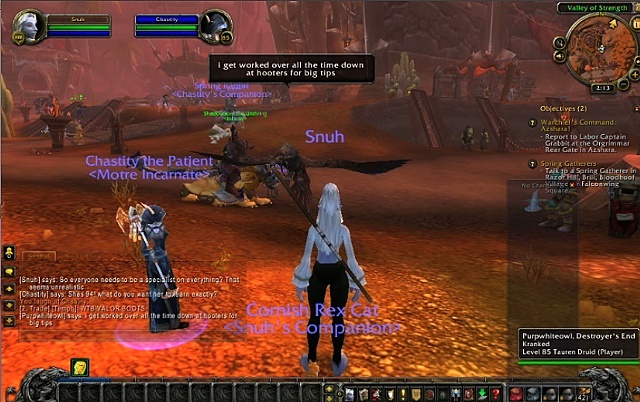 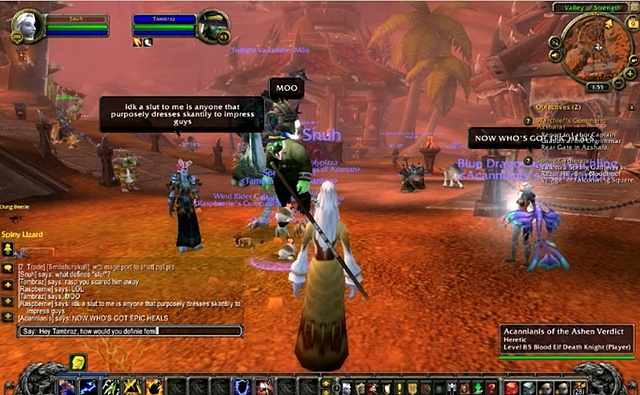 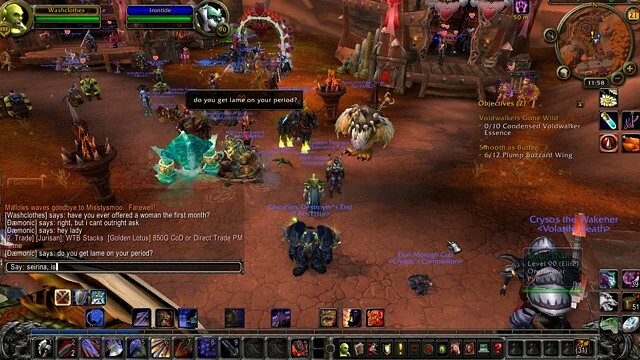 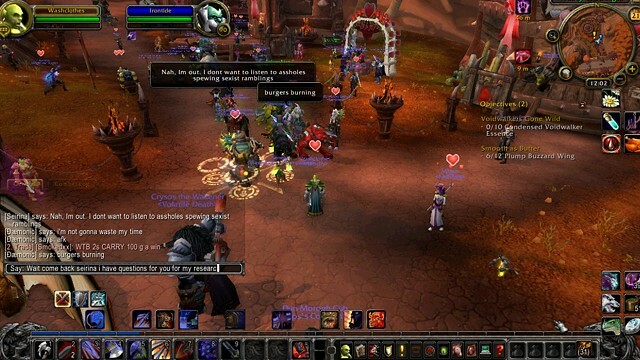 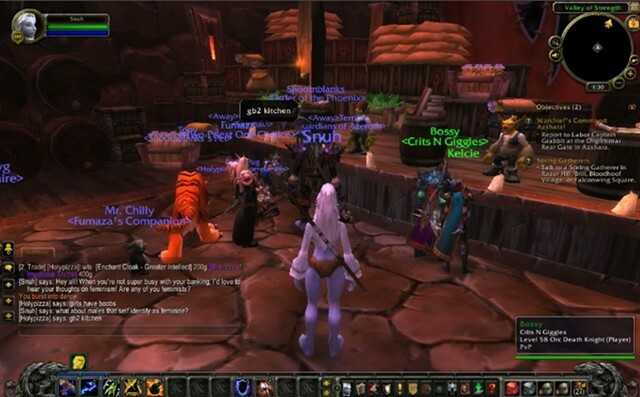 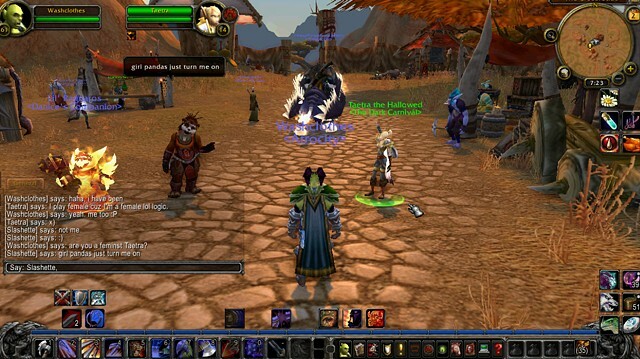 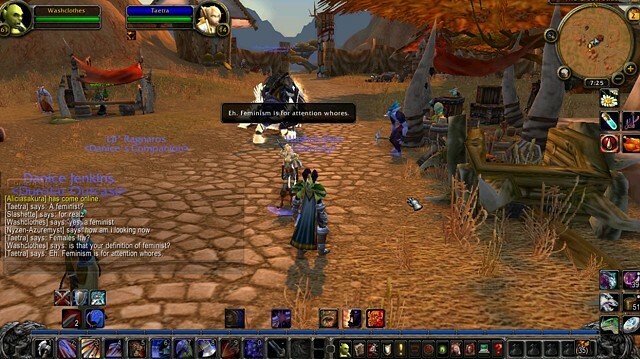 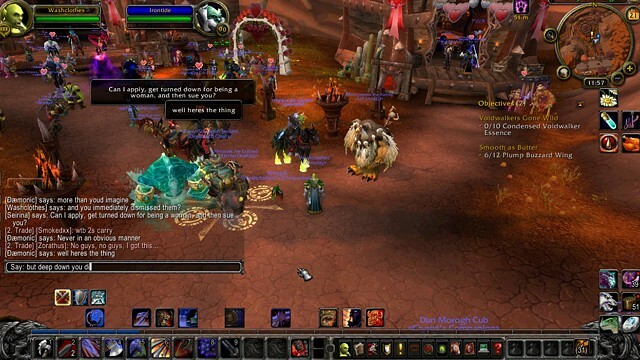 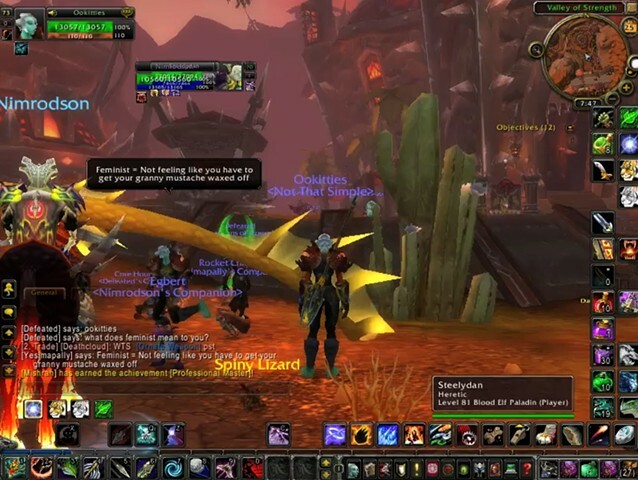 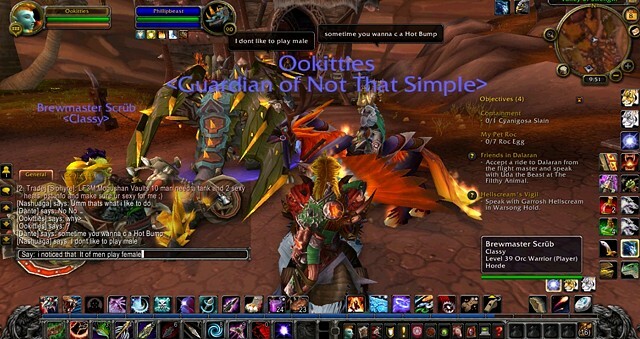 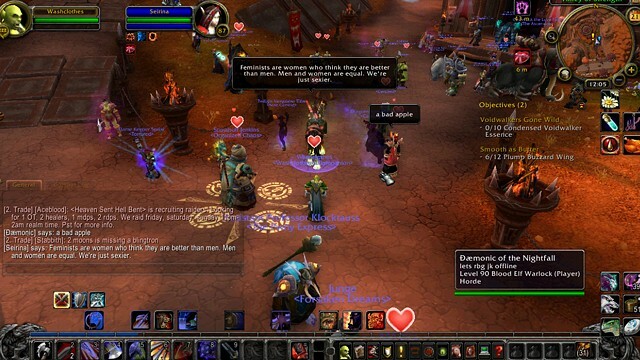 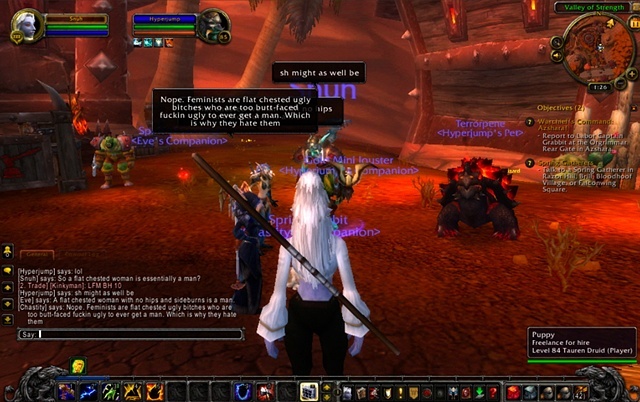 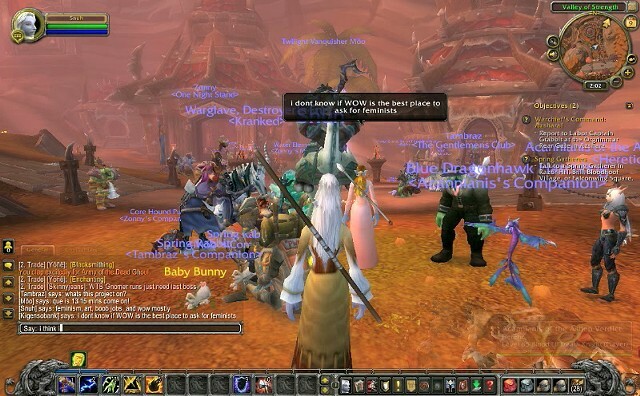 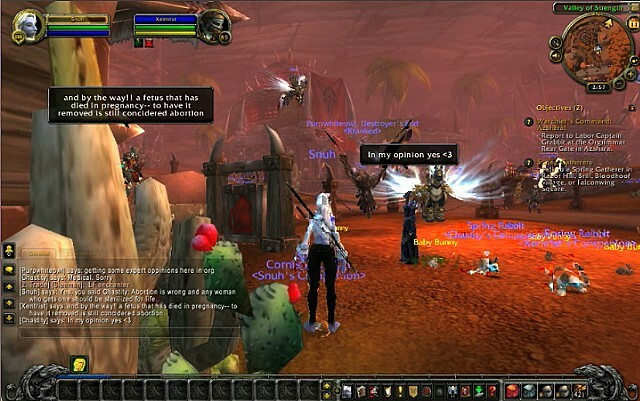 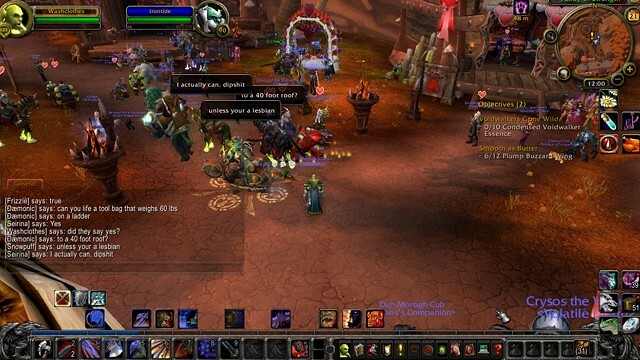 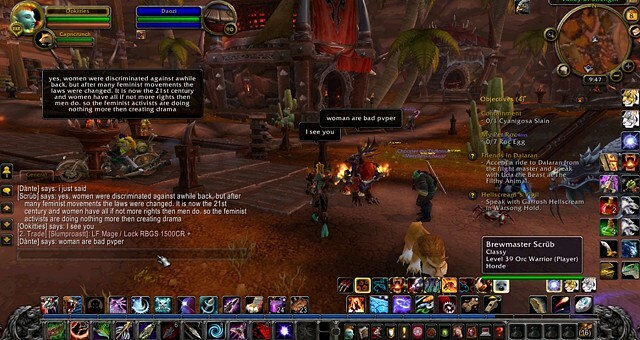 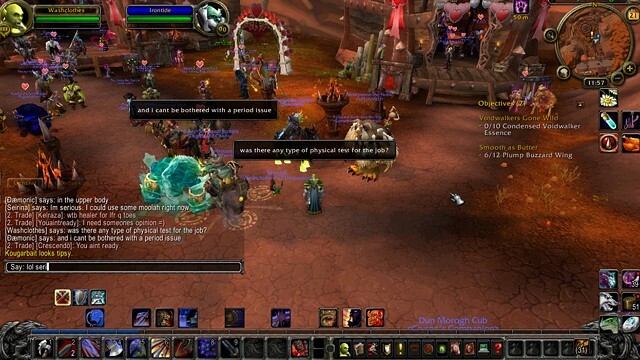 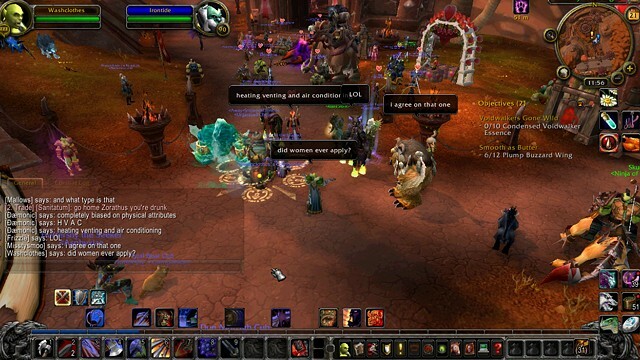 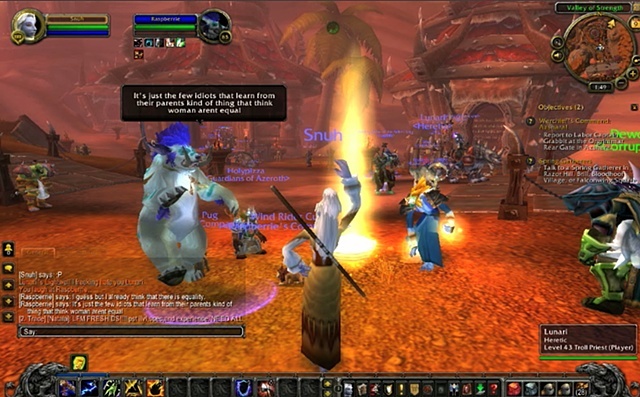 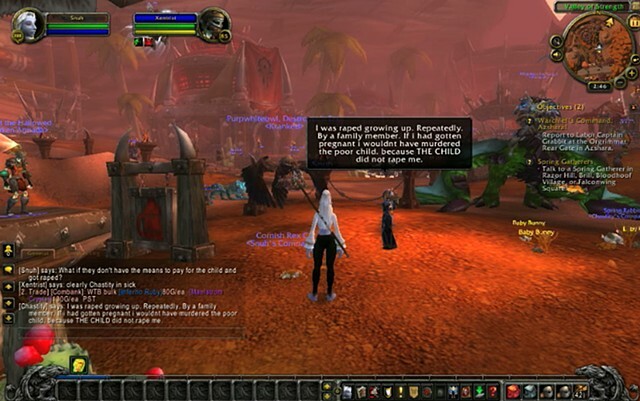 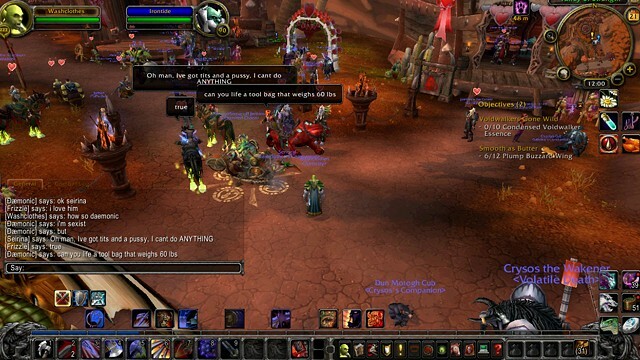 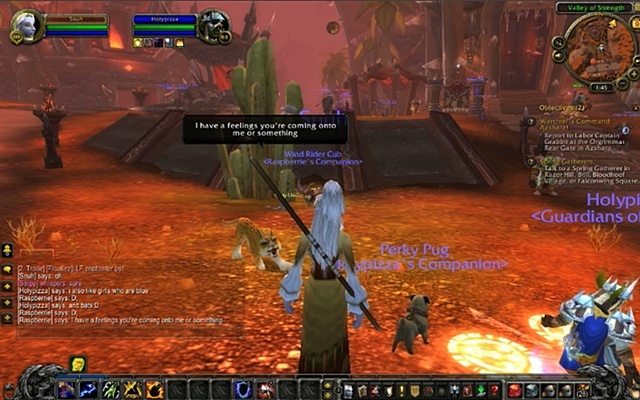 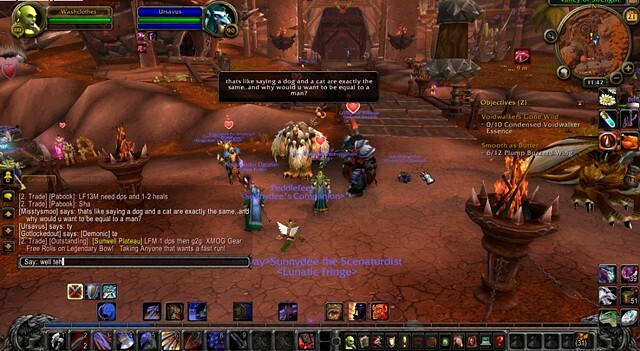 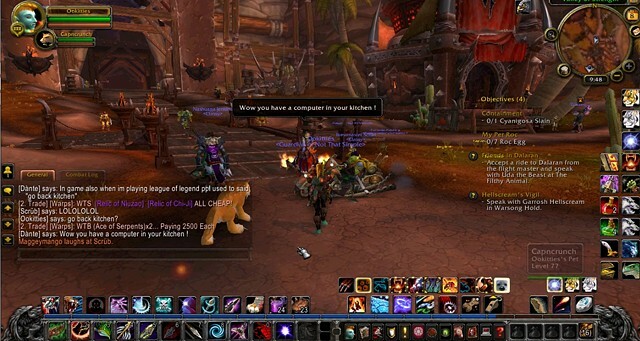 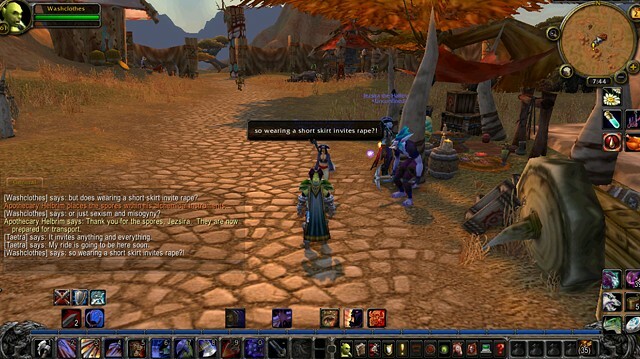 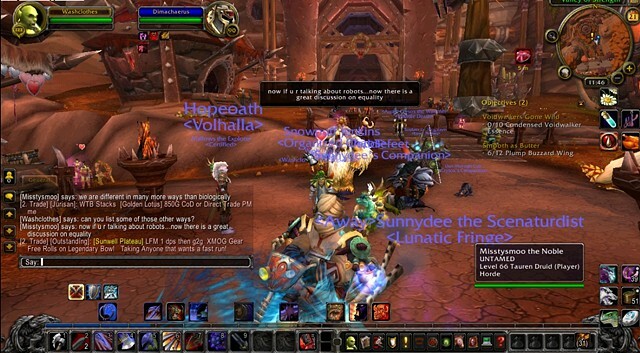 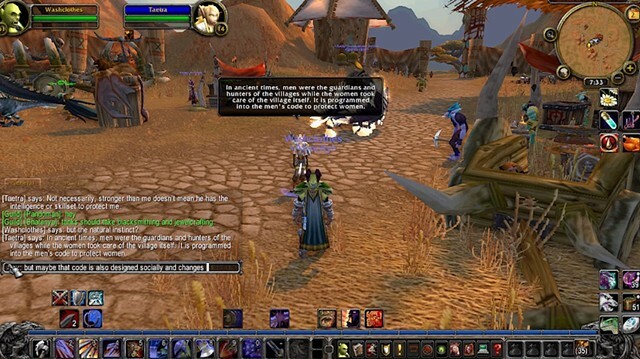 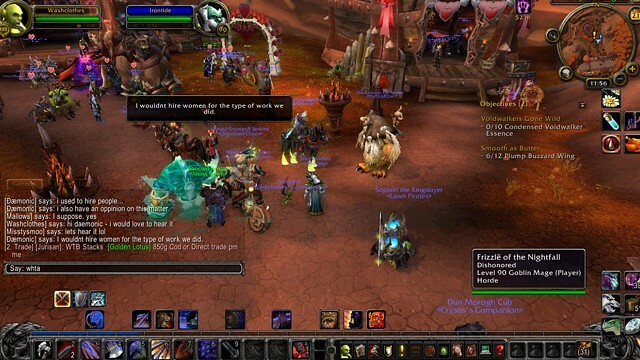 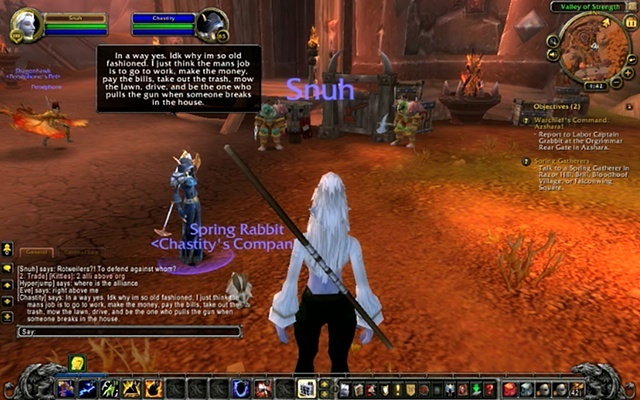 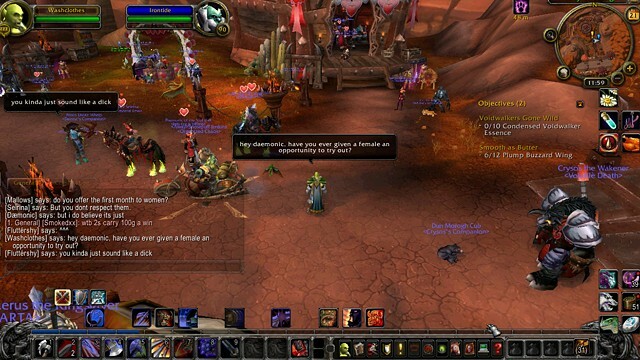 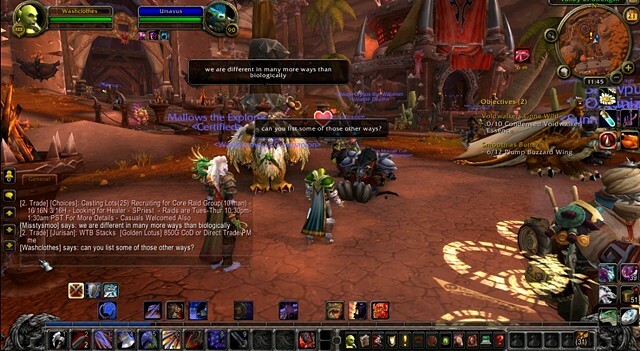 Because of that barrier between the committed and the dabblers, a unique social community is created in each realm of World of Warcraft that few know about, despite the game’s widespread popularity. 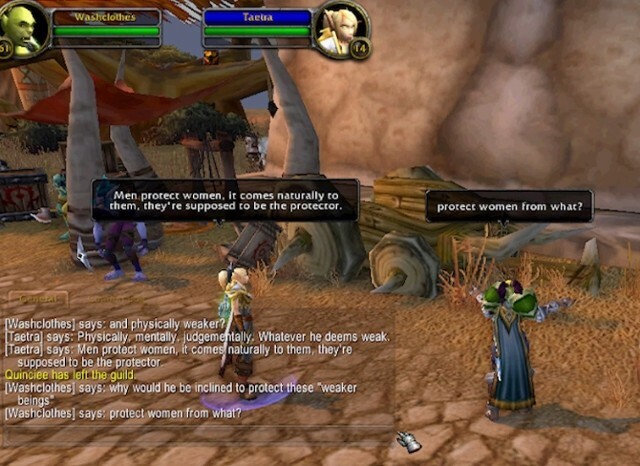 The blatant discrimination, homophobia, and extreme sexism that persist are not a result of the developers’ aesthetics, but the community of avatar-hidden individuals that play it. 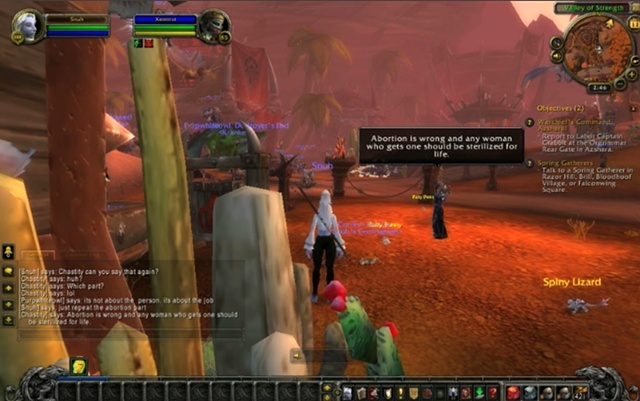 I am creating videos from performances inside of World of Warcraft that investigate the relationship between female players and the intensely complex social communities within WOW. 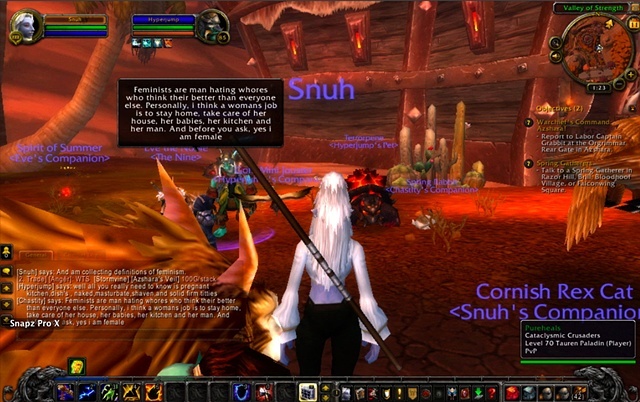 I am working on instituting a system in which players in my community are forced to take responsibility for their oppressive behavior, help to create an environment that encourages women gamers to participate, and present performances and videos to a non-MMO-informed public that is unaware that these communities exist.